Driving a rickshaw, the taxi equivalent of South Asia, is one of the few dignified jobs that low-caste Dalits are able to perform. Most drivers rent a rickshaw for the day, and up to half of their earnings goes toward paying for their vehicle. The entire story changes when they are able to have their very own rickshaw. By raising money for a rickshaw for a needy family, you will allow them to not only have a decent job, but also keep more of their hard-earned money for their needs. The rickshaw, most importantly, will be given by the local church, and allow a Gospel for Asia-supported missionary to share about Jesus’ love. A speedy rickshaw can quickly provide the funds to meet the needs of a struggling family in South Asia. Low-caste Dalits are barred from most decent professions, but driving a rickshaw is one of the few respectable jobs open to them. A family can collect a sustainable, sufficient income for their hard work when they own a rickshaw. 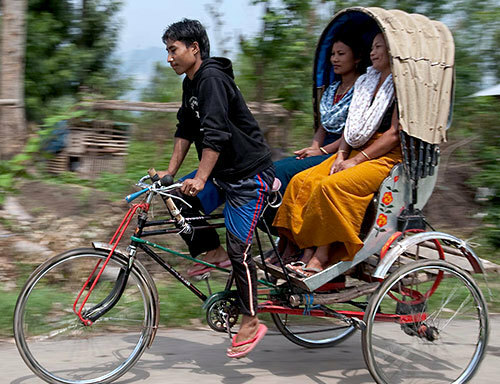 For $200 you can change the future of a family by giving them their own rickshaw and a way to step away from poverty.